Editor's Note: This is Sabina's Facebook note written just after this program's airing, reposted here with minimal editing. I suppose this is going to sound pretty sour, but definitely less than impressed. I think we have to look beyond merely being "grateful" anytime the media picks up on the story and move on, into a careful analysis of the story they're actually telling and the methodologies they are using to tell it. We all know there IS a critically important story to be told here, but Maddow's piece was remarkably disappointing. The very phrases pro-choice people are cueing in on, are precisely the same phrases compulsory pregnancy advocates are also seeing as pure validation. It's never any notion of "our side's" job to make them feel good. Another commenter responded, asking if I could elaborate on where I felt the film "fell short." This started as a brief response and then grew. It is pure stream of consciousness writing, and not terribly structured. Any typos are due to the late hour. There are many pieces I could pull out of the film, but I'll point out an obvious few and then add some analysis. While the film spent a fair amount of time on painting a portrait of Roeder, his family life, some of his personal history, having him speak in his own words, and a full blown oh so television re-enactment of his final Friday night spent with his son, right down to pictures of an ice cream cone, showing how much he supposedly must have cared about his son to step outside his usual Friday night christian co-optation of jewish observances, after watching the film how much do you come away from it knowing about Dr. Tiller himself? It does after all proport to be a film about Dr. Tiller. We see precious little footage in which he speaks in his own voice, and when he does, much of it is about his initial revulsion at discovering abortion had been part of his father's practice. We do hear about how his father's former patients educated him to finally learn how intrinsic abortion is to women's autonomy and survival, but by the end what do you really learn about him? He learned of his fathers abortion provision and was initial horrified. He endured harassment and the earlier shooting, only to return to work the next day. He had charges brought against him both in the courts and by the medical board. He went to a Lutheran church which was where he was murdered. Do we hear one word about how Kansas' Attorney General was later brought up on ethics charges himself for subjecting Dr. Tiller to that harassment suit? No. Do we see an in depth discussion of how woven through with Compulsory Pregnancy Advocates (CPAs) the Kansas political system had become for it to get to the point where these harassment suits could finally be brought? No. Do we see anything that really humanizes Dr. Tiller as anything other than the cartoon caricature of 'a doctor who provides abortion' any notion of him as a man in relation to his family, or him really as anything other than cast in the role in a narrative that was not of his making? No. No reenactments, no ice cream, no postures of prayer in shadowy light. His interaction with Shelly Shannon is portrayed almost as if *HE* was provoking her by giving her the finger. Never mind her behavior at the time or the realities of who Shelly Shannon is, let alone her well documented ties to others who also accept what the CPAs so blithely term "justifiable homicide" i.e. the assassination of abortion providers. Meanwhile, here we have Troy Newman, dressed a suit, against that well lit gray background, 'stunned, simply stunned, I tell ya,' that anyone could possibly be accusing him of being anything other than harmless as a fly. Never mind the fact that his particular iteration of Operation Rescue has Cheryl Sullinger as it's "senior policy advisor/spokeswoman." Sullinger, of course was convicted back in 1988 of conspiring to bomb a California clinic. She spent two years in prison. Her name, "Cheryl," and "Op Rescue," was found on the envelope in Roeder's car when he was arrested. So let's be clear, far from portraying this as simply finding a hotline number in car as Newman would love to characterize this, the number in the car would better be characterized as the name of a convicted conspirator in an attempted clinic bombing. That same attempted clinic bombing conspirator that Troy Newman, in his own little "what me worry" (Alfred E. Newman) sort of a way is dismissing as not in the least bit relevant, and those producing the documentary just eat that explanation up. Had they been familiar with the details of what actually happened, that's precisely the point to question harder, not sit back and accept Newman's dismissal. Somewhere between that lack of familiarity (it's not like all this isn't readily found online at this point) and a more general lack of curiosity on the part of the film's creators, lies not only a validating and legitimizing of these domestic terrorists' words, but this willingness to leave the impression that their version of this history is valid and to be taken at face value. Heck, BACAOR (the "Bay Area Coalition Against Operation Rescue" later BACORR "Bay Area Coalition for Our Reproductive Rights" out of California) had no qualms about calling them domestic terrorists way back when, long before the term came into vogue. They've always shown the media the people like Terry and Newman in suits. What the media seems to have collective amnesia about is the actual track record of these people. When the media puts them up in what I can only term "flatland" where both the voices of those enduring terrorism harassment campaigns and those actively participating as the harassers with the terrorists in their own organizations are portrayed as some sick notion of 'equally valid' and thus rendered flat as the phosphors on a screen audience empathy is turned towards those Americans are predisposed to, the religious, the daddy who sacrifices his own time to buy his son ice cream, those not participating in what so many can only cognize as "icky" abortions, what with all the decades of propaganda so many have grown up under. Worse, when those directly participating in abortion provision are only seen as terming it something they react with initial horror to, as angry, and as utilizing loaded language like "baby" in the course of discussing their abortion provision, where in all this mess is the clear unfettered voice demanding nothing less than women's autonomy? Reproductive or otherwise? 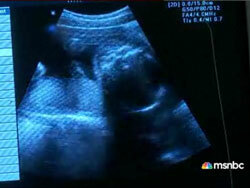 Worse still, what happens when you end up with sonogram images being utilized to negate the very words being spoken? Examine the actual structuring of the video itself, this example from part 2 at time marks roughly 4:43-5:17. We begin with the interview of Doctor Tiller, speaking of the way he learned his father had performed abortions as part of his practice. Dr. Tiller speaks of being "horrified" at the revelation, and upset that women would say his father had provided abortions, "why would these nice people say that he was... scumbag type physician?" Eventually he comes to learn that "abortion is a matter of survival for women." The visuals throughout these sequences reinforce the compulsory pregnancy advocates memes perfectly negating any positive messaging about abortion that could possibly come out of such. Thus Maddow's voice over is rendered little more than a "trusted source" tool to get leftists to both watch and accept anti-abortion propaganda. First we are treated to images of an empty procedure room, complete with stirrups just as the phrase "scumbag type physician" goes by on the audio track. The images go on into standard American medical phobia-land showing sample jars and other medical testing paraphernalia. As he utters the phrase "a matter of survival for women" an image of a sonogram negates/short circuits precisely that focus on women. Throughout this portion, a heartbeat-like drum sound effect plays. Is this then a sympathetic portrait, or does it ultimately fail to step beyond the very memes, both linguistic and visual, that have their core roots in those working to choke off abortion access? Is this our story, on our terms, or is it just another twist on the "fair and balanced" piling up of monkey feces alongside the real and calling them not merely equal in value, but ultimately both through the use of visuals and completely unquestioned narrative portrayed as somehow even more valid? The root problem is, it doesn't take a media conspiracy to produce work this bad. Even those who support abortion access and providers are at this point, so tangled up in a basic inability to think or tell a visual story beyond those false memes that we're at the point where you have plenty of people willing to do this themselves, to themselves. Sadder still, plenty more willing to accept it unquestioningly. For me, it's personal. It's entwined with my personal history. I was a student in Kansas City back in 1989 and I knew people involved in the run up to that mess in 1991, though I was back east at the time. My partner and I were there in 2001 for the ten year anniversary of their merciless summer. We have never accepted the garbage flowing freely out of the mouths of people like Newman. Troy Newman was at Dr. Tiller's clinic in 2001 calling for its destruction. Mike saw it with his own eyes. Doctor Tiller and his staff were and are some damn strong and brave people. The escorts who worked for years under impossible circumstances, and who kept coming even after Dr. Tiller was shot the first time are some of the most committed and amazing people I've ever known. Providers and their families all over this country have endured decades worth of all too often thankless struggles in a climate where their very lives are on the line. Yet to watch this film, the observer comes away with a humanized and proudly unrepentant assassin and a mere cartoon snapshot of the man whose very name is on the film. His voice has been rendered silent by a bullet. Leaving precious little more than the Troy Newmans of this world left to give viewers a "history" such that they now think they know what they think they know. I was glad to see Ann Rose, the three women who had gone to Doctor Tiller for their abortions, though only 2 felt they could or would show their faces and their stories and perspectives were barely there at all, and some of the other Doctor and staff's voices there as well, but trust me, there was far more any one of them could have said that never made it through to the screen. But as always, the entire framing of the piece was wrong, and based in what are more often than not the wrong questions.